Engineering students will be heading to the workforce at a unique point in time for the profession. The American Society of Civil Engineers (ASCE) recently gave the United States a D+ grade for its infrastructure, fueling the need for more engineers, especially those who are not afraid to dream up creative solutions to problems that have plagued roadways, wastewater treatment facilities, bridges, and more. A newfound commitment for companies to complete work in a sustainable and environmentally responsible way is also driving demand for environmental engineers who are confident in their abilities to think outside the box. While many students can look forward to working for companies that allow them to make a tangible difference, it comes along with a great obligation. Their work will impact thousands of people in communities across the globe. It will be up to them to improve damaged structures, provide storm reconnaissance to cities impacted by natural disasters, and help create legislative policies related to infrastructure. It is an intimidating prospect but one where fear can be trumped by inspiration, and if you want to inspire a future engineer, what better place to take them but New York City? 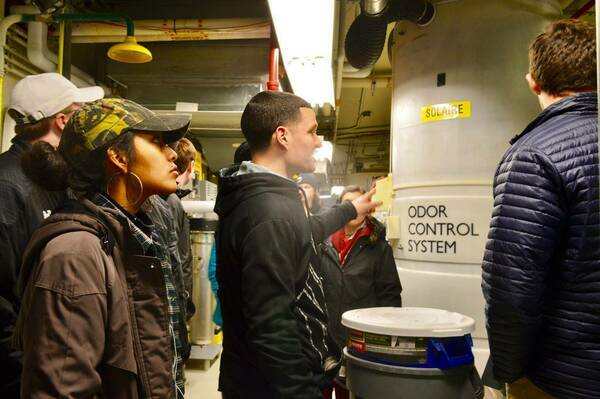 The Department of Civil & Environmental Engineering & Earth Sciences (CEEES) has been taking students in their junior year on a behind-the-scenes infrastructure tour for the past 12 years. The trip has taken them to post-Katrina Louisiana, along the banks of the Mississippi River, throughout the East Coast, and to one of the greatest infrastructure capitals of the world, New York City. Westerink, along with Diane Westerink, CEEES computational hydraulics laboratory coordinator, served as the trip organizers and tour guides during the five-day pilgrimage to the Big Apple. The timing comes at a crucial point in their student career when they are beginning to branch out in the professional world through internships, research opportunities, professional competitions, and service expeditions. The underlying message of the trip though is to help students recognize the incredible responsibility they will take on upon graduating. The trip showed the toll of aging infrastructure on cities, how engineers are incorporating sustainability into the creation of new structures, and about the complex challenges engineers face keeping people moving from point A to point B all while construction is going on. In a perfect world they would be able to carry on with their construction projects uninterrupted but, as the students witnessed, engineers are tasked to keep time with a city’s bustling heartbeat. Though they beat the sunrise with a 5:00 a.m. wake-up call, the bus was filled with excited chatter as all 50 students paid one last farewell to the Golden Dome. “New York could be considered the best collection of urban infrastructure in the same way Rome is the best collection of classical architecture,” said Ben Flanagan. The cramped 14-hour ride was well worth the wait as the bus was greeted by twinkling high rises, flashing street lights, and the iconic red and white blocked letters marking the first stop on the trip, Katz’s Delicatessen. Before departing from the bus Westerink kicked off the official tour with words to reflect on throughout the week. The statement is far from exaggeration. The students would soon learn their future work, and the work of engineers across the globe impacts the lives of millions of people. They provide the clean water flowing from the tap, they design and build the roads, subway systems, and bridges you travel over on your commute to work. In short, they keep people moving and cities thriving. 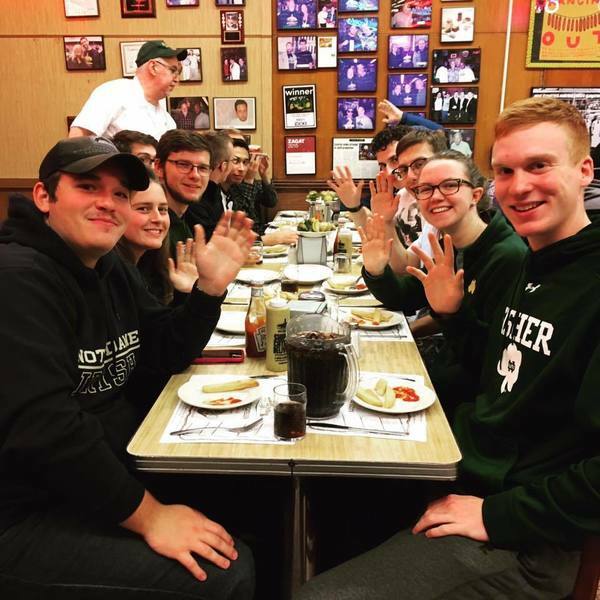 The words would be an important frame of reference for the trip but before the students could get too caught up in reflecting, the true taste of New York, a heaping plate of pastrami on rye, was waiting. To understand New York’s reputation as one of the greatest engineering hubs in the world, one has to start at the beginning. The Brooklyn Bridge was a remarkable engineering feat of the 19th century in the United States. It accomplished several firsts, such as being the first suspension bridge to use steel for its cable wire and the first bridge to use explosives in an underwater pressurized containment structure. It was also the largest suspension bridge in the world at the time. Appropriately, it was the first infrastructure site of the trip, giving the students a taste of what was to come in the following days. It is, without a doubt, an incredible feat that the bridge has served as a beacon of strength and resilience, withstanding decades of pedestrians, storms, and terrorist attacks. 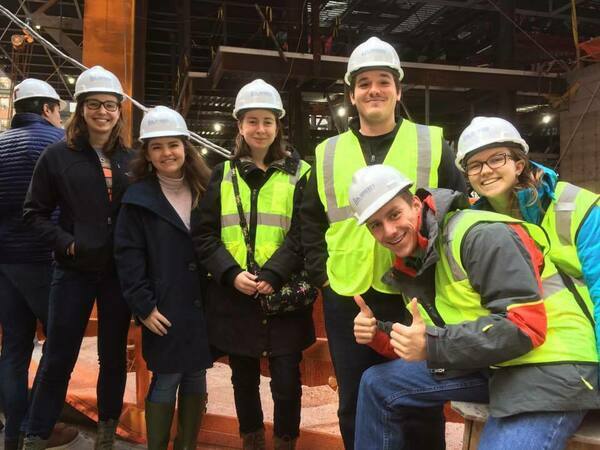 The following morning, not a minute was wasted as students rose early to kick off a full itinerary of sights, starting with the Metropolitan Transportation Authority’s (MTA) East Side Access Project, one of the largest transportation infrastructure projects underway in the United States. Once complete, it will connect roughly 162,000 daily commuters from Queens and Long Island to Grand Central Terminal. “The most impressive part of this to me was that they are doing this right under the nose of the city,” said Annalise Gill-Wiehl. The site of construction lies an extraordinary 160 feet below Grand Central Station’s thousands of unsuspecting passengers and supplies had to be delivered by tractor trailers that navigated the dark, winding, underground tunnels. The gleaming marble lobby of Grand Central Station was a stark contrast to what students would find below. They shuffled through an unassuming wooden door and down dozens of narrow stairs until they were in a massive, cavernous room that would soon be funneling passengers in and out. Blasting through the dense bedrock to build eight new tracks was a monumental feat but getting funding for the project proved to be an equally arduous task. The expansion was originally proposed in the MTA’s 1968 “Program for Action” but construction did not start until 2007, and trains are not expected to leave the station until 2023. The lesson to be learned? Even if you have a plan mapped out, that does not constitute a guarantee that the project will be built right away. “Seeing engineering feats like that was awe-inspiring, showing just how far the human race has come in innovation and understanding the physics of the world around us,” said Teresa Stutts. As one half of the students descended into the muddy chamber, the other half of the group was welcomed to structural engineering firm, Severud Associates, by Notre Dame CEEES alum Edward DePaola. The firm is responsible for some of the boldest structures in American architecture, including the Gateway Arch in St. Louis, the Guggenheim Museum, and the Bank of America Tower in Bryant Park, which became the first Platinum LEED certified high-rise in Manhattan. Upon walking through the door, several of the students excitedly pointed out a series of equations scribbled on a whiteboard. “It was really exciting to see the same equations we use in class being applied to the design of a new skyscraper which will redefine the New York skyline,” said Ben Flanagan. DePaola then explained the entire process of designing and constructing their latest high-rise project, One Vanderbilt. Everything had to be meticulously calculated, from the placement of the support beams to considering environmental factors out of their control. The structure would have to sway and move with high winds or in the rare occasion of an earthquake, but if it moved too much it could leave people trapped in jammed elevators or cause damage to the foundation, putting the entire building at risk. “It just amazes me how civil engineers use a series of analysis and modeling techniques to move from a drawing to a project plan and end up with a building or bridge,” said Alvarado. With a chuckle, DePaola even explained how Severud’s designers had to dramatically alter the design of One Vanderbilt after realizing a window washer would not be able to fit in between the glass exterior and a support beam. Attention to detail is crucial, especially since one minor problem can have a domino effect on the rest of the structure. As the presentation concluded, the students were led by Project Engineer and Notre Dame Alum Daniel Surrett through the hustle-and-bustle of bright lights and honking car horns in Time Square to the busy intersection of East 42nd and Vanderbilt. Nestled right next to Grand Central Station was the construction site of One Vanderbilt, the transportation hub’s soon to be neighbor. “We got to see the whole process of this building going up and my favorite part was how informed the project engineer and construction manager were about the project,” said Annalie Nagel. No detail went unexplained as the students donned hard hats and neon construction vests, making their way through the dim labyrinth of beams, concrete, and supplies. A symphony of banging, clanging, machine beeping and shouted orders echoed throughout the chamber. Yes, you read that right- the crane will rise with the building, relying on support from below. This part of the job is when calculations are crucial to ensure the work environment is safe. Once complete, One Vanderbilt will stand at an impressive 1,401 feet, becoming the fourth tallest building in the city. While some students may be interested in getting their hands dirty on-site, others may aspire to be the magicians who dream up new, innovative structures like the talented team at bridge design firm HNTB Corporation. The team consisted of experts with experience in design, construction management, planning, and transportation, offering students a glimpse of the many directions their careers could take. 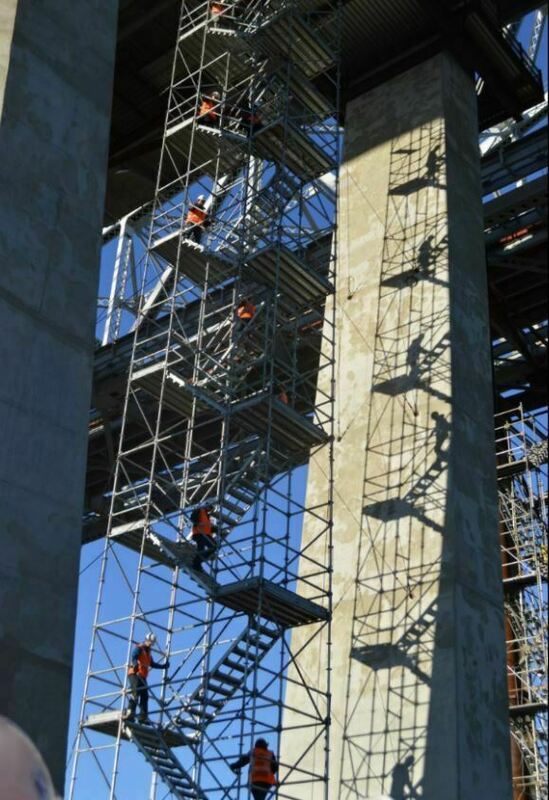 Some engineers were responsible for the logistics of accelerated bridge construction while others focused on safety measures. What united them was their creative drive to improve upon the practices of yore. “These engineers all showed such passion for their work and extensive knowledge for each aspect of the projects they were working on, which made me eager to work on similar projects in the future,” said Megan Irving. 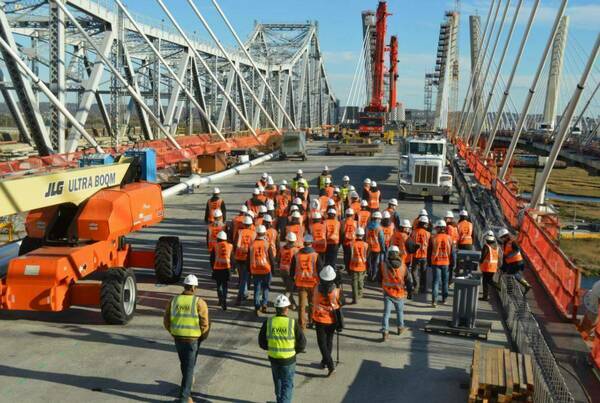 After taking a look at some of HNTB’s previous projects the students had the chance to visit one of their designs being constructed, the cable-stayed replacement of the Goethals Bridge. 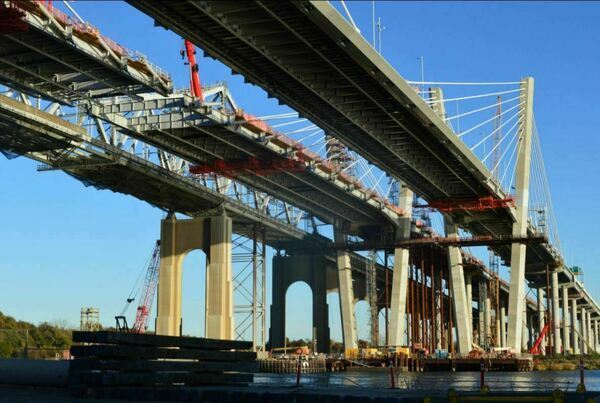 The new bridge, constructed by Kiewit-Weeks-Massman for the Port Authority of New York and New Jersey, consists of three twelve-foot lanes connecting Staten Island and New Jersey, a ten-foot walkway, and five-foot inner shoulder. Once complete, the bridge will even provide crucial data such as wind speed, visibility, pavement temperature, and traffic alerts to avoid slow-downs. Up close the bridge was an awe-inspiring site towering 140 feet above the ground. If anyone had a fear of heights there was no opportunity to waver and turn back once they started climbing the rows and rows of scaffolding, battling strong icy winds as they rose higher. 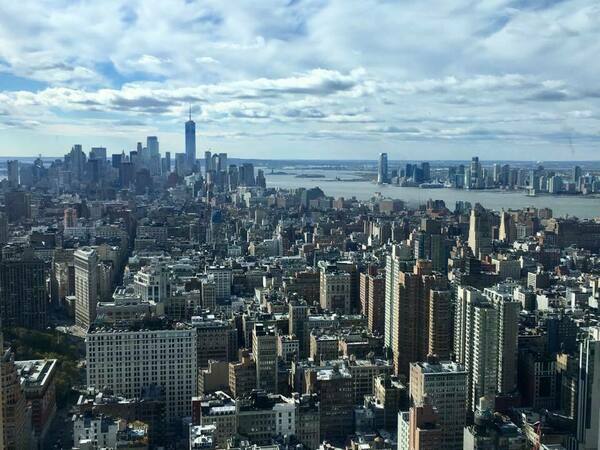 Once on top though, the students were rewarded with breathtaking views of New York City and New Jersey. “We have been taking so many classes, analysis of trusses, beam deflections, bridges – so seeing everything in real life and having an actual civil engineer explain everything was just amazing,” said Alvarado. One of the most interesting aspects of the bridge construction is that the completion date, expected by the end of 2018, has become somewhat of a race between the two crews. However, one of the main challenges to the construction is an issue engineers in the field know all too well – repairing or constructing a structure while it is still in use by residents. “It is a huge inconvenience. People get riled up if a bridge has to be closed for maintenance, or if a road is closed and there is a detour,” said Gill-Wiehl. 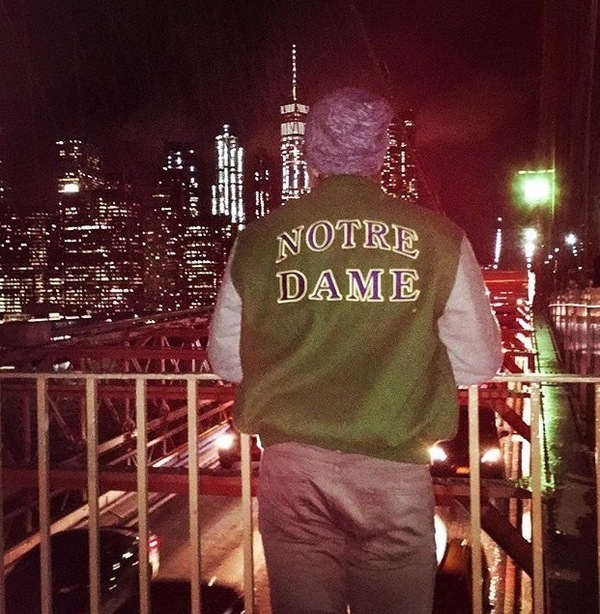 Led by recent Notre Dame alum Andrew Giesel, the group was able to travel as far as safely possible near the middle of the bridge before finally making their way back to the ground. “Coming back down the wind is just roaring, it’s cold, but just breathtaking views of the river and seeing how, once again, they are working right under the nose of the city,” said Gill-Wiehl. “New,” “bigger,” and “better” are words that may be at the forefront of many engineers’ minds when it comes to the ever-changing New York skyline but a growing number of firms are reflecting on the city’s roots and breathing new life into historical structures. 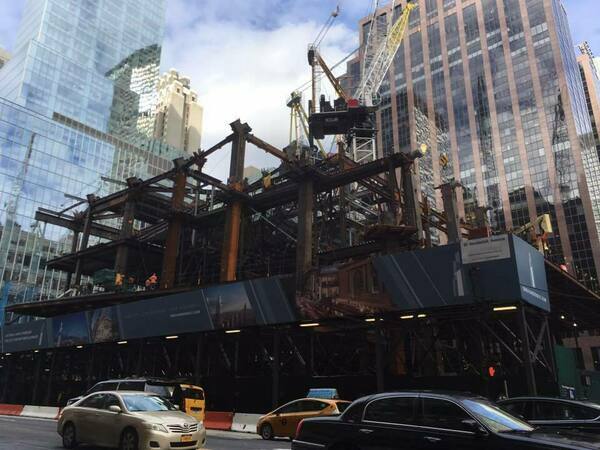 Skanska is just one of the firms choosing to preserve some of New York’s historic, yet dilapidated sites. The company is overseeing the $2.5 billion transformation of the Farley Post Office as the building is redesigned from its original purpose to now serve as a transportation hub for local commuters traveling through Pennsylvania Station. A new Amtrak concourse and connection to the Long Island Railroad will be added, along with commercial, retail, and dining spaces. The students were led through dimly lit passageways as the sound of construction equipment echoed through the chambers. The workers had the unique challenge of trying to navigate heavy machinery through the maze-like structure without damaging any of the historic portions of the building. “The workers at Skanska made it seem easy, but the project takes into account many environmental, economical, and of course, structural factors to get this project in time as required in the initial statements,” said Alvarado. 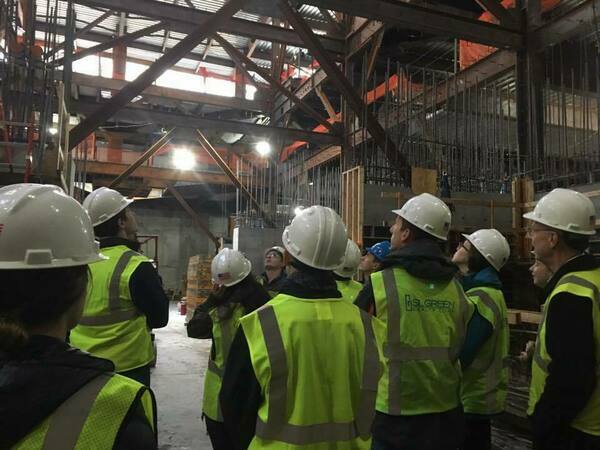 As they toured old and new construction of what will be known as the Moynihan Train Hall, the students had a glimpse of another major challenge they are likely to encounter in their careers, deciding whether or not to take on pricey, yet culturally significant historical restoration projects. “I recognize that once I graduate it will be in my hands to work for a more sustainable society with my civil engineering knowledge, no matter if I am on or off the field,” added Alvarado. Environmental Engineering Student Daniel Stone also observed there will plenty of negotiation when promoting green practices within structural engineering. Fortunately, the push towards sustainable engineering is gaining traction. One of the firms leading the charge is Langan, a geotechnical and environmental engineering consulting firm. The tour started with a chilly traipse through the High Line, an oasis of nature snaking its way through high-rises on Manhattan’s West Side. Three of Langan’s employees, including Arthur Alzamore Jr., a senior associate/vice-president at Langan, generously sacrificed their Saturday to meet with the students. They explained their role in assisting with the design and expansion of the High Line, a former elevated freight rail line that has been converted into a public park. Escaping the cold New York air, the tour then moved to Langan’s offices where the employees explained their projects, domestic and international, and shared their workplace wisdom. First lesson, be ready for the unexpected and be adaptable. Employees discussed projects being halted due to weather, permits, and even due to unearthing skeletons who have long been sleeping under Manhattan’s noisy streets. Most importantly though, Alzamore Jr. teared up as he shared his experience working for a company that fosters passion, creativity, and a community spirit in its employees. He encouraged students to follow their interests and seek out similar values. As Alzamore Jr. explained, Langan is more than a workplace, it is a community and family of engineers who care about quality work. The students then made their way to Battery Park City near Manhattan’s Financial District. In 2000, the Hugh L. Carey Battery Park City Authority instituted mandatory green guidelines for all new residential buildings. 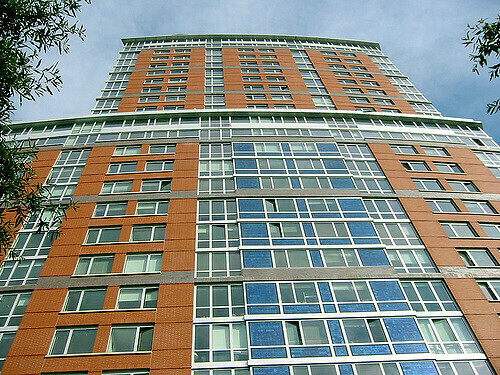 The first building to be completed under the new guidelines was the Solaire, the first Gold LEED status apartment high-rise in the United States. Internationally lauded, the Solaire houses 600 residents throughout its 27 floors. The impressive structure pushed the boundaries of green engineering and construction from the start. All materials used came from within a 500-mile radius to reduce transport waste and 85 percent of the waste accumulated through construction was recycled. Perhaps the most impressive feature is that it is one of the first residential buildings to reuse and recycle wastewater. One would expect to be greeted with a plethora of strange smells but the water filtration room was as sterile as a hospital. There was hardly any indication of what was actually inside the great tanks and colorful pipes snaking across the ceiling. Elsewhere in the building, every nook and cranny of the Solaire was carefully and thoughtfully designed because, in a cramped city like New York, no square footage can go unused. Behind the wastewater facility in the basement, the rooftop was the second most important location in the Solaire. Holes were strategically placed to collect excess rainwater for filtration, solar panels were installed to help power the structure and vegetable gardens provided fresh and healthy food. As of now, a studio apartment at the Solaire has a monthly sticker price of $3,100. It is certainly not the most affordable place in New York but the hope is that new buildings will follow similar guidelines. All too quickly the five-day trip came to a close with one last stop for Sunday morning mass at the historic St. Patrick’s Cathedral. The sacred structure offered a period of reflection for the students to take in all they had seen throughout the week and consider where they feel called to serve in the engineering world. As they saw and heard at the various excursions, they will have many obstacles to navigate, creating sustainable structures, best practices for tending to old, crumbling infrastructure, promoting environmental practices, the list goes on and on. But these are challenges the students of the Notre Dame CEEES junior class are ready, and willing to take on. Similarly, Gill-Wiehl came away from the trip with a greater appreciation of the work civil and environmental engineers do, and how they impact our daily lives. For some, visiting the sites and design firms gave them a clearer vision for the future. And even the long bus rides to and from New York played an important role in students being able to connect outside the classroom. “I definitely feel closer to many of my classmates now, especially after spending so many hours together on the bus,” said Flanagan. Perhaps the most important takeaway from the trip was the fact that now, and after they graduate, the students will still be connected to a global Notre Dame family. “Just seeing a Notre Dame person at each place we went was very cool because it just shows the reach Notre Dame has within the construction, structural, and environmental community,” said Garcia. And in this family, guidance, expertise, and wisdom are readily available. “It was just amazing to see how everyone was willing to show us their firms, show us their projects and they were just wanting to help, wanting to offer their support in that case,” said Alvarado. As the bus pulled away, the junior class was leaving New York with a new perspective and appreciation for their field of study. “Overall, it was an awesome glimpse into where my classmates and I will all be in a matter of years,” said Brigid Kelly. Perhaps in a few years, they will be the ones leading tours, explaining their work, and inspiring future CEEES students to be changemakers in society. Originally published by Allison Preston at conductorshare.nd.edu on January 17, 2018.